The retreat is designed for individuals 18 and older. The activities and events are geared to this adult-aged group. BCTAC does not provide attendant support at the retreat. Members are required to bring their own attendant for personal care. Click to view the gallery! We are the 2015 BCTAC Urban Adventurers! This year’s Retreat marked a welcome variation in venue, as we hosted the event at the Sheraton Hotel at Fisherman’s Wharf in sunny San Francisco. With a launching pad as central as this, we were able to explore and participate in a variety of activities that San Francisco has to offer. 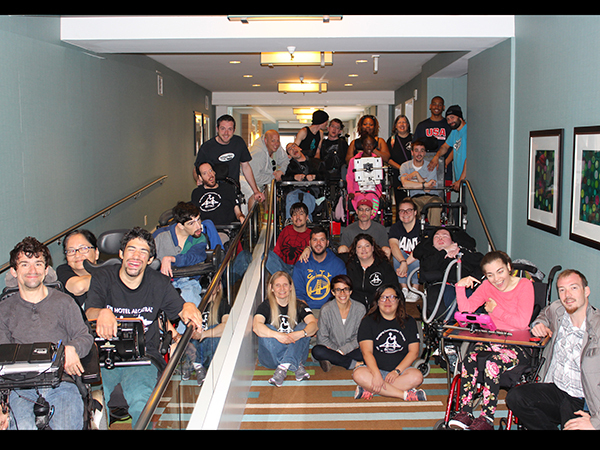 Our Retreat wrangled individuals who use AAC from all over the states – California, Oregon, and even Alaska! The purpose of our Retreat extends beyond playing and exploring the many activities in and around the city. It’s our time where we have four solid days to connect and continue to build our community of friends. For us, it is an opportunity to support every person’s voice and to cherish all of the unique individuals in the group. The days were full of both business and fun! While some folks decided to wake early and stroll the streets, others would share breakfast together in the master suite. The Suite was spectacular and was BCTAC‘s home base for the large group activities and meetings. From here, we embarked on excursions to places like Alcatraz Island, The Big Ships in the bay, The Exploratorium and Cobb’s Comedy Club where we were witness to the standup act of Jennifer Coolidge from the movie, Legally Blonde. Central to the BCTAC mission and as part of our outreach efforts, we unleashed our inner Urban Adventurer spirit. We used our talents to create, organize and express our personal experiences through a music video using our interpretation of the song “Animal” by Pearl Jam. Be sure to stay tuned to our Facebook page for our completed video. In it, you’ll see how we took over the beach just below Ghirardelli Square with our all-inclusive Animal Flash Mob. We also shared our personal stories of breaking down barriers through a series of interviews with the community. We all break down barriers in our own ways. For some of us, talking about it gives us courage and makes it easier to do. Our music video represents the spirit of our group – We’re wildly creative! We also held a BCTAC presidential election and elected our new presidents. Stay tuned to our Facebook page for more information on our elections. Also, check out BCTAC‘s Facebook for all the Retreat photos. A very special thanks goes out to Retreat Planning Committee – April Bryant, Patrick Regan, Tyson Renze and Sam Vranizan. You guys worked so hard to organize and collaborate on the activities and all of your hard work contributed to such an amazing Retreat – GO TEAM! Summer is close and so is the 2013 BCTAC Biennial Retreat. This year, the crew decided to head back to Via West! Whooping it up in the woods this summer will include a lil’ bit of everything and a ton of fun! The crew arrives in the early afternoon to check in, catch up with friends and meet the new folks attending their first BCTAC retreat. In the evening people will wind down, decide on a few movies to watch, chill and then head to the sleep lodges to rest up for the next day. Folks will get creative and design Rock Art – artwork that is sold as part of BCTAC‘s fundraising efforts. To see Rock Art from previous years, please visit BCTAC‘s Facebook page. People will team up with their buds to play dodgeball and kickball. Last year, the team names were hysterical – Team Train Wreck!?! Stay posted for team pics! Club BCTAC is in the hizouse! Casino Royale, Bingo, Black Jack, Wheel of Fortune and Roulette! What happens at Club BCTAC, stays at Club BCTAC. The crew will participate in a Self-Advocacy presentation by Jake Atteberry, a BCTAC member and David Grady of Area Board 7. For more information on Jake Atteberry and/or other BCTAC member’s personal bios, check out Meet the Crew. The group will plan for Club BCTAC‘s nighttime swim party with DJ sets, and music videos – think VH1! For some additional fun, the crew will choose a water sport/game to play in the pool. BCTAC will discuss their AAC/Accessibility Review project, similar to Yelp only better and any goals they would like to achieve with this endeavor. BCTAC will meet to talk strategic planning, discuss goals for the group that align with BCTAC‘s mission and calendar future BCTAC activities and events. In September 2011, the BCTAC crew headed to the woods for their annual retreat! On the agenda was creating ROCK ART to sell at the 2011 Annual Bridge School Benefit Concert. Images of past artists from the concerts, watercolor and brushes, a Bridge School playlist on the iPod, and boom…ROCK ART! Along with that, Club BCTAC was in the house where a few of the crew planned and performed a DJ set for club night. On Sunday, it was all about health, fitness and basketball! Check out the images from the 2011 retreat. Retreat activities change and evolve based on the input, decisions and goals of the group. Activities may include invited speakers addressing topics of interest, roundtable discussions, presentations by members, and fun day and evening activities to just hang out with friends. Rock Art – Artwork inspired by rock music and created by the BCTAC crew. The final masterpieces are sold at The Bridge School Benefit Concert as part of fundraising efforts for the group. Alternative Art – During free time, retreat attendees can choose to design and create their own art using adaptive tools and materials. An adaptive sport or fitness activity is a part of every retreat. Some of the activities may include: yoga, swimming, basketball, soccer, etc. Because relaxing and chilling out is also important to retreat attendees, time is set aside where crew members can head to the sleep lodge for a little rest, do a little audio reading, play video/board games, take a nature hike, socialize, etc. contribution and level of participation in BCTAC fundraising efforts, web content development, planning meetings, etc. For more information on schloarships or to apply, contact bctac@bridgeschool.org.